Which brand? What type? Where from? How much? These are the questions that are likely running through your mind when buying a new mattress. Well, you’ve come to the right place. In this guide, I’ll help you answer all of those questions and you’ll be having sweet dreams in no time! So you are interested in a new mattress. Perhaps your current mattress is hurting you, or you wake up tired. Maybe you just want a bigger size. Maybe you’re moving and don’t want to lug your old mattress from place to place. Whichever is the case, my goal is to help you select the right mattress so you don’t make a mistake and so you don’t pay a penny more than you have to. A mattress is perhaps the most important piece of furniture in your home. If you get the recommended 8 hours of sleep per night, you will spend at least 1/3rd of your life in that mattress (To get tips on how to make the most of your time on a mattress, check out our Sleep Resources). That means if you keep that mattress for 9 years (which is about the average), 3 of those years will be spent on it. However, many of us don’t think about our mattresses and how it impacts our lives every day. In this guide, I will go over the basics of selecting the correct mattress. Elsewhere on the site, I will go into more detail on each of these topics and more, but this will be enough to get you started. If you just want a recommendation, check out some of our top picks below. This is one of the most common questions that I get. It’s a simple question, but the answer is not. The real answer…it depends. Mattresses are not one size fits all. Your decision should be based on your specific sleep preferences. Below are our recommendations based on the category. Read on to learn more about why we believe these are the best mattresses. Leesa brings top-notch materials to the production of their flagship mattress and went through over 200 prototypes to get it right. It checks all the boxes in terms of the typical features most people are looking for – cooling, edge support, motion transfer, etc. The buying experience turned out to be pleasant as well. The customer service was helpful and they have a gracious trial period and warranty. This recommendation takes a lot of factors into account. There may be mattresses out there that are bigger or more specialized, but in terms of the best all-around mattress for a reasonable price point, it’s hard to beat the Leesa. Nectar stands out in a few different ways, but the most obvious is the value it offers. Simply put, Nectar will appeal greatly to shoppers looking to get a quality mattress on a budget. Don’t let the budget conscious design lead you to believe that this is a basic mattress. The Nectar actually has 5 different layers, each with a specific goal in mind – such as cooling, comfort, support, and durability. Here is another kicker…you get a year to decide if you like it. Their 365-day trial is industry leading, yet the company claims to only have a return rate of 3%! The Nectar may not be overly engineered with tons of frills but with the dollars you save on this mattress, I’m sure you could go out and purchase some fancy accessories of choice to go along with it. Like the Nectar but looking for an extra feature or two…check out it’s older sibling, the DreamCloud further down the list. If you’ve looked around for mattresses before, you’ve probably heard of Tuft and Needle. Their Original mattress was (and still is) a huge success. Well, they decided they wanted to do better. The Mint was their solution. They took the winning elements of the Original, added some extra bells and whistles and the Mint was born. T&N added new proprietary foam materials to help with a handful of the most common requests in the industry(e.g. cooling properties). T&N has used their years of industry experience to craft a mattress that is hard to compete with from a quality and value standpoint. It’s slightly more expensive than their original, however, I don’t think you’ll mind the few extra bucks for the upgrade in product. The DreamCloud mattress has not lack of frills. At 15 inches, this mattress is one of the thickest in the business, packed full of features to help you get a better night of sleep. Amongst these features include their “BestRest” Coils, arranged in five different zones to accommodate different pressure points of the body. The construction features don’t stop there. The coils are just one of 8 layers! There are multiple layers of memory foam; some gel-infused, some “regular,” and some proprietary. They’ve even thrown some latex in there for some extra bounce. This is all wrapped up in a cover with a cashmere top. If you haven’t guessed, this mattress also falls into the “luxury” category, but you may find it as a cheaper option compared to some of it’s peers. Couple this perk with an impressive trial period (365 days) and a lifetime warranty, The DreamCloud finds itself as our Best Hybrid! The majority of people sleep on their sides and while it may not be as vulnerable of a position as back or stomach sleeping, that doesn’t mean any old mattress will do. Typically a softer mattress helps align the spine while on your side, avoid unnecessary back strain. At the same time, you don’t want to sink in too much! The Puffy Lux fits the bill. With the “Dual Cloud Foam” construction that has found a nice balance between comfort and support. The folks at Puffy put a great deal into being thoughtful with how their mattresses respond to the body. And in this case, it’s a big win for side sleepers. The Sapira has upped the game in the mattress space. From the same makers as the Leesa mattress(Our “Best Overall”) the Sapira is a step above. It also comes with a slightly larger price tag, which is why it was outdone by the well-rounded Leesa. That’s not to say the extra cost is not worth it if you’re looking for the top of the line. This mattress fits is considered a “Luxury hybrid,” meaning made with premium foam and individually wrapped coil springs. This combination offers great performance for folks concerned with motion transfer, but still, want to comfort and performance of memory foam. While this comes with a luxury price, from a comparison standpoint, feature-to-feature, you’ll find this mattress competes with products at triple the price. If you’re willing to shell out a few extra bucks, you can’t go wrong with a Sapira. Back pain can be debilitating, especially when you can’t even escape it while asleep. At the same time, it’s a common problem. Level Sleep may be your answer. Level Sleep has kept no secret on who they are here to serve, and it’s people with back pain. They have taken a scientific and clinal approach to design a product to fight back and joint pain. This mattress is made of three different zones that cradle the body with different materials, in an effort to maintain a neutral, comfortable position throughout the night. This is one of those mattresses that may not be a great fit for most people, but if you fall into the back pain category, then Level Sleep is a great option. Traditional memory foam mattresses had a bad reputation for retaining heat and baking people as they slept. We are nearly 30 years and many iterations removed from that original offering in the industry. GhostBed has leaned into the challenge of ensuring a cool night’s sleep by delivering a 7-layer mattress with cooling elements in all but the most dense support layer at the bottom. Nature Sleep, the company behind GhostBed is an industry veteran and it shows in their products. These guys know their mattresses. This thing is packed with proprietary technology! The Aurora is considered a luxury mattress and is top of the line for Brooklyn Bedding. Part of the price tag is going towards a lot of research and development into their unique materials. You may have read it elsewhere, but one of my favorite things about Brooklyn is that they manufacturer all of their own products (and maybe even some of the other mattress brands you’ve heard of. There is no denying that people come in all shapes and sizes. Mattresses do as well, however, not in a size and shape made specifically for heavy folks…until recently. The Big Fig mattress offers many features found in the most popular mattresses – cooling technology, motion transfer support, etc., but with some extra engineering to accommodate a bigger body. This includes things like higher density foam, additional coils, and even a custom box spring for sturdy support. This mattress performs best up to 1000 lbs. for couples or 500 lbs. for a single sleeper. Have you been looking for some extra support? You’re going to love this one. Once thought of as a super luxury item, latex mattresses are becoming more affordable thanks improved technology and competition. This is great news for those shoppers looking for alternatives to mattresses made of synthetic materials like memory foam. The Nest offers their latex in a hybrid construction in three different firmness levels. All made with natural components. What are you giving up by going natural? Well, not much to be honest. This mattress still offers great support and features like cooling technology. Want to go green while you sleep? Check out the Nest Latex. This newcomer took “natural” to a new level. Joybed offers a foam-free mattress and hones in on the benefits of mother nature’s materials. Made from cotton and wool, Joybed found a nice mix of organic materials to still offer breathability, support, and temperature regulation. This all sits on top of pocketed coils for support and a medium to firm surface. Joybed may be one of the newer brands on the scene, but they’re off to the races and at a reasonable price point is a great option for those looking to keep it green! If you can find a mattress that keeps you in proper alignment while not causing any pressure to your body, you’ve found a good mattress for you. There are some other minor factors to look for. They include motion transfer, edge support, and temperature. There are two major factors to look for in a new mattress. They are support & comfort. Support: You want the mattress to hold you in proper alignment from head to toe, so you don’t wake up with a backache. Comfort: You don’t want the mattress to cause pressure to your body, which causes tossing and turning, which means you wake up tired. The most important factor in finding the correct mattress is proper support. You need the mattress to push up on your body to counteract your body weight. So that means a hard, firm, stone-like mattress, right? Wrong. You’ll notice that the mattress dips down around her shoulders and hips, but her spine is in proper alignment. If the mattress were too hard, her hips would be pushed up and her shoulders would be pushed up, and her spine would not be straight. If you’re in this position for too long, you can wake up with a backache. Additionally, if you keep changing positions to try to keep your back in alignment, you’re not getting into the deeper stages of sleep, which causes you to wake up tired. The same exact consequences occur if a mattress is too soft, and you’re in it like a hammock. You want a mattress to contour to the shape of your body to hold it in its neutral alignment. The second most important criteria for selecting the right mattress are comfort (or as you may hear it called pressure relief). If a mattress is too hard, it can cause pressure to your body. This cuts off circulation and pinches nerves (ever wake up with a “pins and needles” feeling in your hand? ), and will cause you to change positions frequently. If you’re frequently changing positions, your sleep is fragmented and you don’t get into the deeper stages of sleep (such as REM sleep). This means you’ll wake up tired, even if you thought you got 8 hours of sleep. When you’re trying out the mattress, you should be able to lie in one position without moving around for at least a few minutes. If you can do that, you’ve found a good mattress. Those are the two main criteria. If you find a mattress that keeps you in proper alignment which doesn’t cause pressure to your body, you’ve found a great mattress for you. To help fine-tune it from there, there are a few other things to consider. There are several other criteria that you can look for when searching for a mattress. If you share your bed, you want to minimize motion transfer. If your partner gets in or out of bed, or changes positions, you run the risk of being woken up if the mattress transfers too much of that motion to your side of the bed. Try the mattress in the store with your partner, and have your partner switch positions while your back is turned to see how much motion you feel. Another issue some people have is heat retention of the mattress. Most good mattresses these days have features to help mitigate this (advanced foams, phase change materials, ventilation, etc). The biggest risk here is with cheap memory foam mattresses. You want strong edge support on your mattress, particularly if you sleep near the edge of the bed, or sit on the edge of the bed often. Most of the average or better innerspring mattresses use the upgraded foam encasement around the edge, but some of the very cheapest mattresses just use a steel rod on the side. Foam encasement is better. Memory foam mattresses don’t often have separate edge support because of the nature of the foam (it’s designed to take the shape of your body, even when you’re just sitting on it). You might have noticed that in all of this time, I haven’t mentioned any details about the construction of the mattresses. I’ve said very little about coils, types of foam, etc. Truth is, this is possibly the least important part of the guide, but it’s still good to know. There are three basic categories of mattresses. Specialty foam. These will usually be made of different types of foam. Two categories of specialty foam are latex and memory foam. (Leesa is a favorite in this category). Innerspring. These are the traditional mattresses with springs (or coils if you prefer). They can be all tied together or individually wrapped(US Mattress has the best selection in this category). Hybrid. In recent years, brands have come out with “hybrid” options for people interested in certain aspects of both foam and innerspring. They have features similar to a specialty foam mattress but on an innerspring support. You can read more about hybrids here (Sapira is a favorite in this category). Beyond these three major categories, you’ll find a few other types of mattresses. Some manufacturers make air mattresses, that use air chambers instead of coils for the support. Also, there are still some waterbeds around, in which water is used for the support. I honestly don’t know as much about these two categories of mattresses, and they make up a small part of the mattress industry, so I won’t go into them here. The biggest air mattress manufacturer is Select Comfort with their Sleep Number bed. There are several small waterbed manufacturers. Still not sure? Take the quiz! Foam mattresses are becoming much more popular, and they tend to get higher customer satisfaction ratings than innerspring mattresses (though they might not be what you’re used to). There are two major types of specialty foam, and a foam bed will usually have at least one of them, if not both. There is latex, and memory foam. Memory foam is probably the most recognized type of foam in bedding. It is a slower-response foam (meaning it takes time to return to its normal position). This has the benefit of not causing pressure to the body. Memory foam is perhaps the best pressure-relieving material that is used in beds today. Memory foam is often mixed with a type of gel to add additional support and to help keep a more neutral surface temperature. Older styles of memory foam (and cheaper Chinese memory foams) tend to retain heat. Most modern memory foam mattresses don’t have this issue. Most of the time, these types of foam will be put on a base of what’s called “poly foam,” which is just a high density, resilient support foam. It’s not really designed for comfort, but it will hold the mattress up. Some lower-end mattresses are only made of poly foam, and these tend to feel harder. The last thing to be careful of with specialty foam is to be wary of foams made in China. They tend to be lower quality and won’t hold up as long as many foams made in America or Europe. I made this mistake with my first mattress shortly after joining the industry. My mattress felt amazing for the first 6 months but quickly lost both its comfort and support. Most mattresses you’re likely to run into are the “innerspring” type. They have metal coils inside of the mattress with foams and fibers on the top. The lower priced mattresses tend to use the older style coil in which they’re all tied together. The hourglass-shaped ones are called “Bonnell” coils, but other manufacturers have stronger variations on that type (like the “offset” coil and the “continuous” coil). These are generally a little less expensive than the individually wrapped coil, but don’t contour as well and transfer more motion. On the left are Sealy “classic” coils that are all tied together. On the right are the higher end individually wrapped coils. 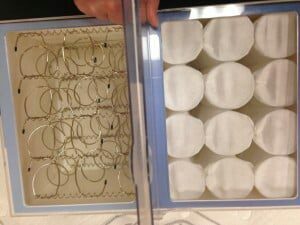 The better innerspring mattresses will use individually wrapped coils. This type of coil allows the mattress to contour to your body from the coil level, which gives better support and causes less pressure. Additionally, wrapped coils are better at separating motion from side to side on the bed. So if one person bounces around or changes positions, the partner will not feel it as much. The downside? They’re usually more expensive. The foams above the coils will have varying densities. You can get a mattress with firmer foams on the top or softer foams on the top. Some will be in the style of a “pillowtop” (which means the manufacturer sewed an extra cord around the side of the mattress to indicate it has a good amount of foam). You may hear people talk about “coil counts.” There is a reason I’ve written this much and haven’t really mentioned them until now. They’re generally not important, as long as you’re not getting the least-expensive mattress. There are too many variables to consider to compare coil counts in one mattress to another. Type of coil, gauge (thickness) of the coil, the number of turns, whether or not its doubled up on the inside, etc. One mattress might have 1,000 coils, and another will have 900, but the 900 coil mattress might have a lot more steel in the coils overall. The one thing I can say is to avoid is any mattress that has 420 or fewer Bonnell coils in a queen size. Those are only suitable for guest rooms, and they’re barely good for that. If the number is above that, you’re probably fine. Many people who I talk to have no idea what a mattress is supposed to cost. They hear specials on the TV along the lines of “pillowtop mattresses, queen size sets for only $299!” and they assume that it’s for a good quality every night use bed, and there are options even less than that. The mattress industry does itself a disservice by advertising like this because that’s usually the absolute rock bottom as far as price and quality go. So how much should I spend on a mattress? You can find a mattress and boxspring set (in a queen size) for as low as $200 all the way up to as high as you want to spend. For example, a Tempurpedic Grand Bed with a motorized base can run you almost 10,000 dollars, and that isn’t even the most expensive mattress. So how much should you spend? $0-200: This is probably a used mattress from Craigslist. Eww. $200-400: These are your basic guest room mattresses. Expect to see those 420 coil Bonnell units I warned you about earlier. These may or may not have a pillowtop, and will have a 1 to 5-year warranty (click here for information about mattress warranties). Can be used by an adult for every night use in a pinch, or if you’re on a really tight budget, but you don’t get much in the way of comfort or support. $400-600: These range from some of the nicer guest room mattresses to maybe the bare minimum for every night use by an adult. You will either get nicer foams on the top than the cheaper ones, or stronger coils, but not usually both. The ones with a 10 year or more warranty will usually have no pressure-relieving foams up top at all, while the ones that have some nice layers of foam will probably still be using the 420 coil Bonnell unit. These tend to be good for college students on a budget. 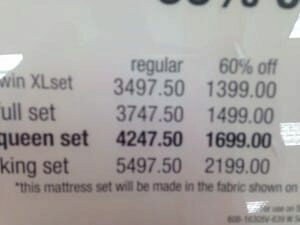 $600-1000: These are about the average range for every night use mattresses. These are where a lot of your Sealy Posturepedic and Simmons Beautyrest lives. You will get the better coil systems and advanced foams for coil mattresses. This is also the price range that the lowest priced memory foams start appearing. The direct-to-consumer mattresses I mentioned elsewhere in this article generally fall somewhere around this price range. If you find a memory foam mattress for significantly less than $600, you should be very skeptical. $1000-1500: These mattresses will be the entry level of the luxury mattress. The coil systems might be a little more advanced, or they’ll use thicker layers of the specialty foams. The foam mattresses will be a bit thicker, and you start getting into the big name brand memory foam models. $1500-2500: Mattresses at this price range will have just about everything you could hope for in a mattress. You’ll get the thickest layers of the best foams, strong coil systems, and longer warranties. Many of your Tempurpedics live in this price range. If you’re spending $2,000 on a mattress, you’re very likely to be getting a great one. Warranties tend to be longer here too, ranging from 10-25 years. $2500-5000: There’s honestly not much you can add to a mattress to get to this price range. The best Tempurpedics reach this range, and some of the most expensive Stearns and Foster luxury mattresses come up this high as well. You might start hearing about materials such as “New Zealand wool” and “Mongolian horse hair.” Only spend this much on a mattress if the ones at the lower tiers don’t keep you in proper alignment or relieve pressure as well and you have the money to spend. $5000+: I’ve only ever tried one mattress in this range, a Duxiana, and it did not feel as good as mattresses for 80% less money. There’s only so much you can add to a mattress before it’s counterproductive. If you’re considering spending $5000 on a mattress, make sure it supports you and is more comfortable than the cheaper ones. Don’t just buy it because it’s expensive. If you really want to spend $5000 on your sleep set, your money would be better spent on accessories like an adjustable base for the mattress. I’d take a $3000 mattress with a $2000 adjustable base over a $5000 mattress any day. Since modern mattresses aren’t all made to be flipped like traditional innerspring, few will work on your leftover frame and boxspring. Factor in the price of a new base. Nearly all mattresses these days work on flat surfaces—like the floor or a platform without a box spring. Adjustable bases work, too. Adjustable bases can prop you up for easy phone, computer and tablet use or lay you flat for sleeping. (ADVISORY: Sleep experts recommend avoiding screens two hours before your bedtime!) Adjustables are great for people who need to elevate their heads to ease sleep apnea or their feet for circulation. Most modern mattresses will work with an adjustable base, but they can add $800 or more to your total. What about the factors, besides price, attached to the actual purchase? Shipping is often free but normally will vary based on where you live. If you live anywhere beyond the lower 48, you’ll likely pay a fee. Delivery time will vary based on (1) where you live, (2) if the mattress is custom-made and (3) if you want to pay for expedited shipping. A custom-made mattress will delay the actual delivery 1-2 days. Overall, you should plan on a 3-to-10-day delivery window. Set-up for boxed mattresses involves a little more than taking it out of the box, hauling it up on your base, unrolling it and freeing it from its plastic covering. If you need help, you can pay for “white glove” service and have someone else do it. If the company does its own delivery. they will likely haul away your old mattress. Trial periods vary but you’ll most often get between 90+ nights to try out a mattress. Some companies let you try it out for a year. Don’t assume you’ll know right away if the mattress fits your needs. It takes time to get used to it. Returns have conditions, though most returns are free and you often received a full refund. You can’t just get the mattress, sleep on it a few nights and return it the following week. You are normally required to try it for at least 30 days before companies will accept a return. Warranties vary but often mimic terms from brand to brand. They’re usually limited, cover 10 years and apply only to the original owner. Companies will only accept mattresses back for manufacturing defects, not wear and tear or user abuse or the user changing their mind. A mattress is often the most expensive piece of furniture that you’ll own. Finding the right fit is really important. But so is not breaking the bank. These days, there are a lot of mattress companies that are “on sale” at all times. However, if you happen to be shopping around a holiday, there is a good possibility you can find an extra discount because of the holiday sales events. That’s not to say that you won’t find a deal around smaller holidays or other events that are specific to that brand. Pro Tip: Sales usually start upwards of a week or so before the actual “main event.” So if you’re worried about an item going out of stock, or just can’t want for a better night’s rest, you probably have some luck in the days leading up to the holiday. These sales and discounts are perfectly predictable, so if you’re looking for a head start, click over to our Coupon page. We keep track of current sales and also have some exclusive discount you won’t find on their mattress sites. Your first order of business will be to choose a store to shop at. Feel free to pick several to shop around, especially if they’re near each other. There are several types of stores out there. I will give the pros and cons of each. You can always buy a mattress online. There are dozens, if not hundreds, of sites you can choose from. You can even go to Craigslist and get somebody’s used mattress for free (eww). Pros: You get to shop for a mattress without leaving your house, you can shop dozens of companies quickly, and you’re likely to find a low price. Direct-to-consumer mattresses have taken the industry by storm and offer great options delivered right to your doorstep. Brands like Leesa(what I personally sleep on), DreamCloud, and Tomorrow Sleep all sell great mattresses at reasonable prices. If you’re in the market for one of the traditional brands, websites like US Mattress tend to have the lowest prices anywhere. Most of the direct-to-consumer online stores, like Leesa, Nest, and Tomorrow Sleep offer a “risk-free trial period.” The free return policy completely negates the only con of buying online. Some of the bigger online brands are also starting to have a few storefronts, where you can try but still order for delivery. If you’re not sure which of the online options to pick, I have a mattress quiz here to help you find the mattress that best fits your needs. Another exception: If you try a mattress in person, you can buy the same or similar model online if you can do the comparison shopping. In fact, this is the strategy I recommend in my mattress negotiation guide. These are stores like Sam’s Club and Costco. You can buy a mattress, a gallon of ketchup, and 144 rolls of toilet paper in the same trip. Pros: Low prices, comparable to what you’ll find online. Cons: Like online, you often cannot try all of the mattresses (they might have a couple out on display), and even if you can, you will get no expert help in selecting the right one. They also have a smaller selection. Lastly, you need to be a member at some of them. Many department stores like Macy’s and Sears will have a section dedicated to mattresses. Cons: The prices are a little higher at department stores than online or at big-box retailers. You might need to take advantage of their price match guarantee. The salesperson there is not likely to be well-trained in selecting the right mattress, and very well might have been working in a different department a week ago. Also, there tends to be a lot more foot traffic through the department, so it’s awkward to try out the mattresses. Department stores also tend to play “games” with their prices, so be careful. Like department stores, furniture stores will also often have a section dedicated to mattresses. This is sensible since a mattress is a piece of furniture. Pros: It is convenient to have a whole bedroom set and a new mattress delivered at once. Sometimes they’ll give you a very low price on a mattress if you’re buying an entire bedroom set. These guys sell just mattresses and items directly related to mattresses. Some are huge chains (like Sleepy’s and Mattress Firm), some are little local shops. The local shops vary wildly from high-end boutiques to small guys trying to compete head-to-head with the big guys and anything in between. Pros: Most salespeople will be well-trained and knowledgeable about mattresses and sleep. These will usually have the largest selections. Many of the large chains will have aggressive price match guarantees, so if you’re a good negotiator, you can get the lowest prices here. The boutique shops don’t often have any wiggle room, but they are also more fairly priced, to begin with. Cons: The retail prices tend to be higher (but again, most will have a price match guarantee and the most room for negotiation). The experience is highly dependent on how good the salesman is. I recommend doing one of two things. Buy a direct-to-consumer mattress. They have free return policies, so if you’re not happy, you can just return it for a full refund and then try option 1 above. To help you pick the right one, click here for my mattress quiz. Shop at a mattress specialty store to find the right mattress, then find it online to get the lowest price. (If you need help comparing model names, consult my comparison charts here). If the salesman gives you a hard time about matching the price, just buy a comparable model online. Option 1 is a lot easier and cleaner, and I’d bet you can find a mattress that fits your needs. Option 2 is more time consuming and can be frustrating, but if you like to test first, you can often still get a good deal. Alright, so you’ve selected a few stores to go to and you’ve checked out some online mattress stores to get a general lay of the land. Next, you need to set aside some time to properly try the mattresses. This is not a purchase that should be made over a lunch break or in a few minutes. Set aside an afternoon to go mattress shopping. Expect to spend up to an hour or so in a mattress store trying mattresses. Next, you walk into a store, gaze upon the sea of white rectangles and are approached by a salesperson. What do you do? The biggest thing to realize is that the salesperson is there to help you. Most salespeople I work with genuinely want to help you find the right mattress. The slimy “used car salesman” stereotype is somewhat uncommon (though not unheard of) in the mattress business. Just give him or her a chance to help you. Most of the better stores will have a process in place to help find the right mattress. But the key is to take the time to try the mattresses. Once you’ve narrowed down which mattresses offer the proper support and relieve the most pressure, it’s important to spend some time on that mattress to make sure it works for you. If you’re having trouble deciding between two mattresses, spend several minutes on each one. Whichever you can spend longer in one position on without tossing and turning is likely the better mattress. Try it on your back, try it on your side. Remember to check for proper support and comfort. I have a mattress negotiation guide, so read that for an in-depth treatment of this topic. I will just summarize here. The prices of mattresses are negotiable at most retailers and on most brands. In mattress shopping, the general strategy is to play one retailer off of another. Most places have a price guarantee. So if you get a quote from one place, you can take it to a competitor and have them beat the price. Take that price to another competitor and get an even lower price. You can also look up the mattress online (like at US Mattress) and get the retailer to match the online price. This is the easiest, least painful way to negotiate on mattresses. If you don’t have time to go back and forth between retailers, online prices are usually the best as long as you are good at comparison shopping. So you can find the mattress that works best for you, and then just buy the comparable model online. Comparing mattresses can sometimes be tough, though, since the exact model name will differ between stores. Don’t let that scare you off, though, because the lineup is usually the same from retailer to retailer. For example, Simmons Beautyrest currently has its recharge lineup. They have 3 major levels of Beautyrests: the entry-level ones, (which used to be called “classic”), the Platinum models (which used to be called “World Class”), and a luxury level above that which may differ from retailer to retailer (Beautyrest Black, Beautyrest Legend, etc). Even though the specific model names will usually differ, a Platinum Luxury Plush at one retailer will be virtually identical to a Platinum Luxury Plush at another retailer. Mattress specialty stores tend to give you better service, online tends to give you better prices. Shop around and take advantage of price beat guarantees. Since online prices tend to be lower, make the brick and mortar store beat their prices to earn your business. If you get a coil mattress, individually pocketed coils tend to be better than ones that are all tied together. Avoid low-count Bonnell units. If you get foam, avoid cheap Chinese foam mattresses. Expect to spend at least $750 for a good quality mattress and boxspring set. If you spend more than $2500 on a queen set, you’re deep in the “diminishing returns” territory for your money. If all of this seems overwhelming, buying an online mattress with a free return policy is a reasonable alternative. If that doesn’t work, then you can go back and try the other steps. Leesa, Nest, and Tomorrow Sleep are common choices for this, though there are others (browse around my website for reviews). I hope this helps you get a better night’s sleep without spending a penny more than you have to! For more information, read the related articles. Want to know how to negotiate a mattress price? With this quick and easy guide, anybody can get a great price on a new mattress with little hassle.